A sculpture of a double-headed eagle, a national symbol of Russia, is seen in front of a Russian national flag flying at half-mast on the roof of the State Hermitage Museum in St. Petersburg, Nov. 1, 2015. With Russia now ruling the downing of Metrojet flight 9268 an act of terrorism following the attacks in Paris, the Kremlin is expanding its air campaign in Syria and calling for a grand global alliance against Islamic State. Yet Kremlin critics argue this "window of opportunity" to end Russia's isolation depends on whether the Kremlin can distance itself from anti-western rhetoric it has promoted in recent years. In a televised meeting at the Kremlin, the head of Russia's security services, Alexander Bortnikov, informed Russian President Vladimir Putin what many in the West had long suspected: there were "traces of foreign explosives" among the Metrojet airliner wreckage. It can only be a terrorist act, concluded Bortnikov. In turn, President Putin vowed justice and declared those responsible would be hunted down wherever they might hide. "We will find them in any place on Earth and punish them," the Russian leader said. A woman lays flowers at a makeshift memorial for victims of a Russian airliner which crashed in Egypt, outside Pulkovo Airport in St. Petersburg, Russia, Nov. 4, 2015. To some Russians, Putin's tough talk sounded familiar. Boris Veshnevsky, a lawmaker from St. Petersburg where many of the Metrojet victims are from, notes that Putin made similar calls for vengeance back in 1999. Then, a series of mysterious late night apartment building bombings in Moscow and other cities killed and injured hundreds of people, terrorizing the country. Putin, at the time a newly appointed prime minister under President Boris Yeltsin, blamed Chechen guerrilla fighters for the attacks and promised to "rub them out in the outhouse." The bold talk launched Putin's political career, said Veshnevsky. This time, he added, Putin's reluctance to label the Metrojet crash an act of terror again has a measure of political expediency, as to admit it was terrorism right away would mean giving credence to those who said this was revenge for Russia's air campaign in Syria. Many argue the Kremlin launched that air campaign for geopolitical reasons, such as propping up its ally, Syrian leader Bashar Al Assad, rather than taking on Islamic State. But with the Metrojet incident now ruled terrorism, President Putin is calling for Russia and the West to overcome their differences on Ukraine, Syria, and other issues by joining in a grand coalition to defeat Islamic State. Russia has intensified its attacks on ISIS targets in Syria and Putin has ordered his military to coordinate with what the Russian leader now calls "French allies in the struggle against ISIS." 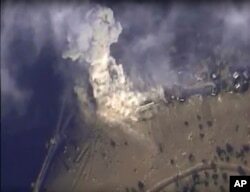 FILE - This photo made from footage taken from the Russian Defense Ministry official website shows a Russian airstrike hit a target in Syria. Alexander Baunov of the Moscow Carnegie Center said that while many in the West expressed doubts over Russia's motives for entering into the Syrian conflict, Putin has gradually refashioned Russia into an indispensable partner through its military actions. Baunov noted that French President Francois Hollande's first trips following the Paris attacks were to Washington and then Moscow, a move that speaks volumes. But Kremlin cooperation in the face of tragedy, too, is a familiar refrain. After the 9/11 attacks in the United States in 2001, Putin was quick to offer condolences and argued Russia and the West should overcome their differences to combat terrorism – then in the form of al-Qaida. It is an alliance that many felt largely worked until the threat seemed to go away. Still, Boris Veshnevsky said the Kremlin's new offers for an alliance with the West depend on whether it can wean itself off of anti-Western rhetoric that has ratcheted up Putin's popularity over the past two years. Veshnevsky said that judging by Russian TV, it is not clear who is the bigger enemy – America or Islamic State. It is political schizophrenia, he said, and it cannot go on forever.